A diamond in the rough. This Victorian Lady was design number 44 in George F Barber's Victorian Cottage Architecture book, 1891. Over time this structure converted to apartments. 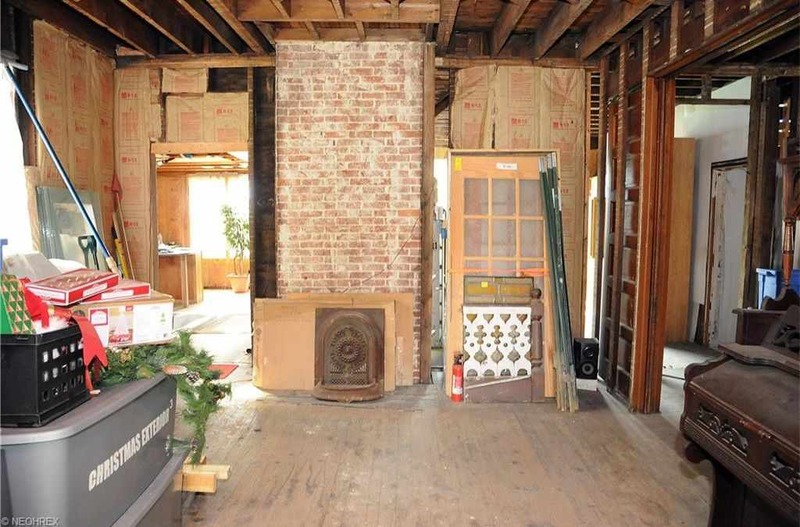 The current owner had plans to renovate the home. 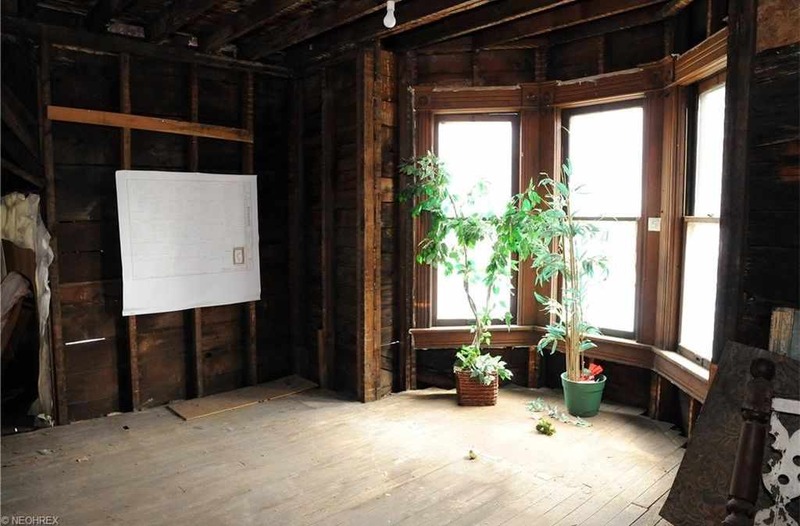 It is currently a blank slate inside. The home has been rewired with 200 amp service. Everything else needs done. This is a shell of a Queen Anne waiting for prince charming to restore her to her original beauty. I dislike posting houses that are shells but always liked this particular design of Barbers. 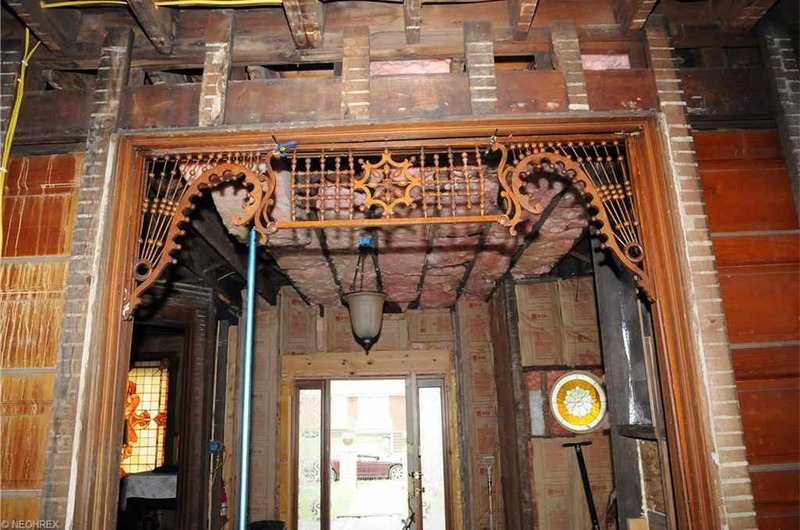 Even an interior “shell” could still retain original features. Trim? Some doors? Staircase? 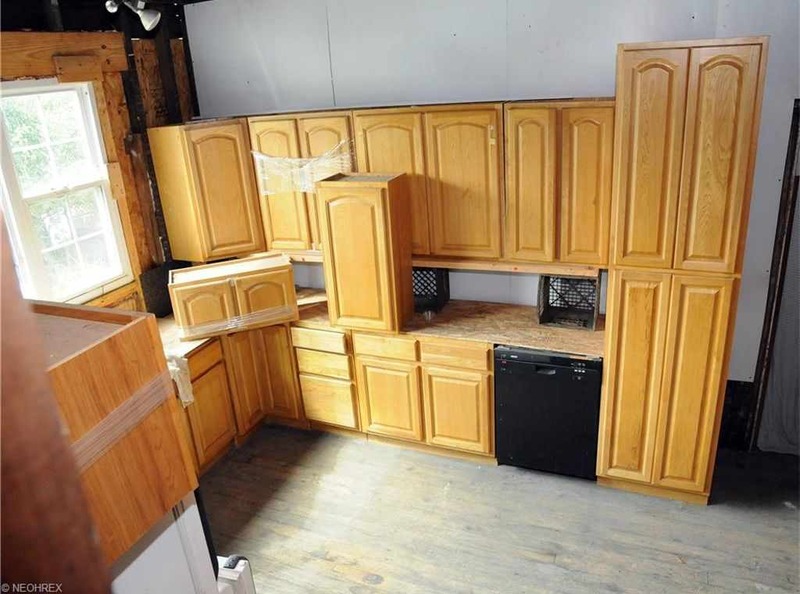 I agree with John; I wish the seller would include interior images. 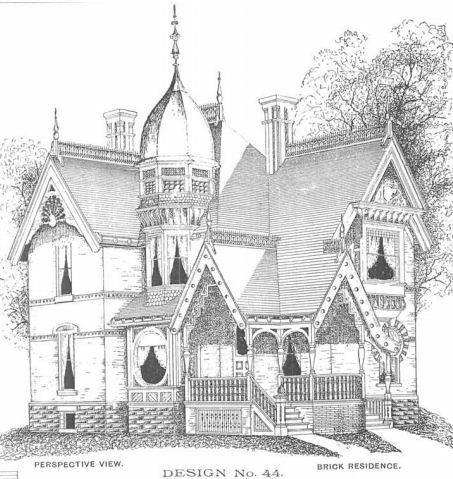 “Victorian Cottage Architecture” is the Dover reprint of “The Cottage Souvenir No. 2”, which is available, free, online. Even without interior photos, I fell in love with this house. Wish my pockets were deeper, my SS check was bigger, and I wanted to live in Ohio. Oh a fairy tale from the outside, right down to the fence! Yummy! To me if it’s a George F. Barber it is worth saving. To me he designed the most beautiful Victorians with so much attention paid to details. Can you tell his houses are my favorite? the architectural features on the outside are so unique. 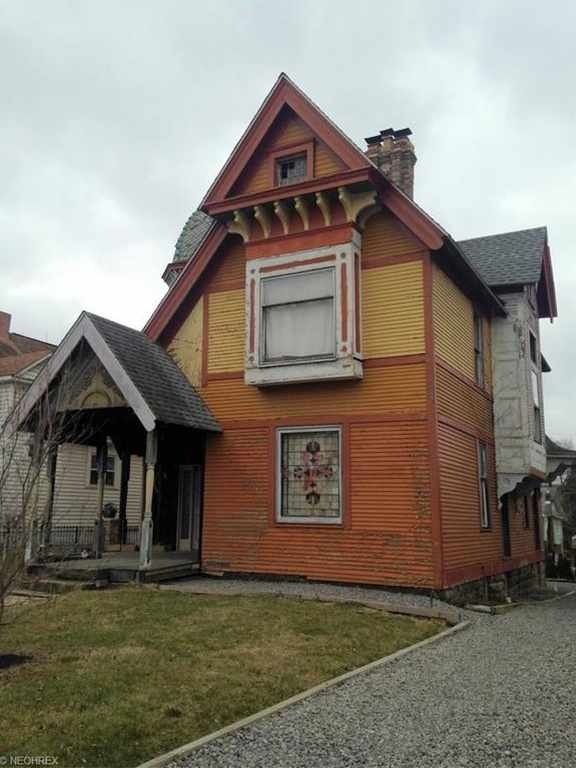 It looks as if most of the parts are there on the exterior, except some of the gingerbread on the porch. 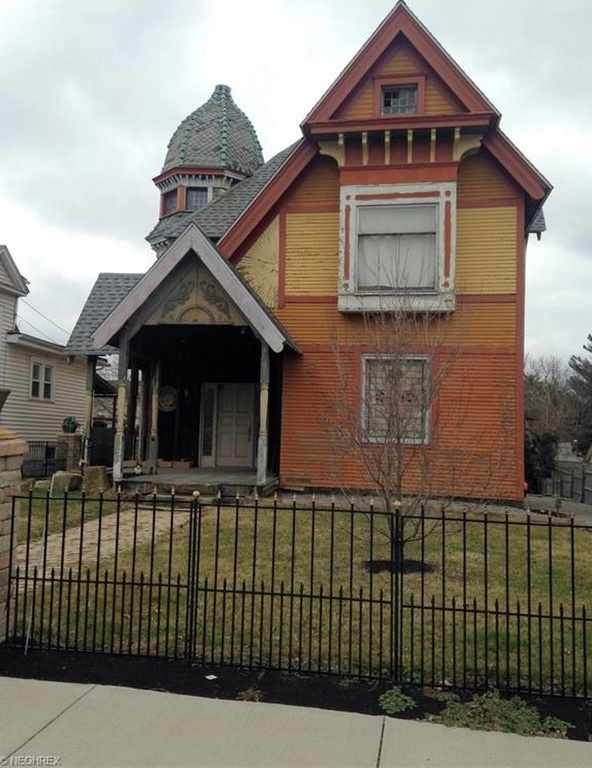 There appears to be an addition on the back which doesns’ match the original house in any way. I agree about the interior. It would be nice to see some interior shots, no matter what the shape! Thanks for posting. I was prepared for a totally gutted shell but instead was happy to find at least a fair number of period interior details have survived. 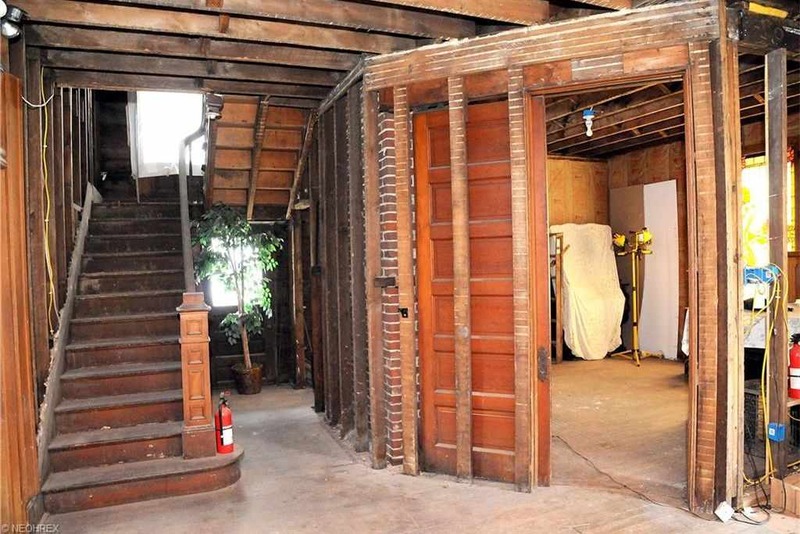 Although keeping the original plaster walls and ceilings would have been preferable, at least with the walls open electrical, plumbing, and HVAC upgrades are easier to do now. I’m far less discouraged by this house than I was previously. The entry has been reframed and replaced but I’d find a period correct salvage version to put back in. 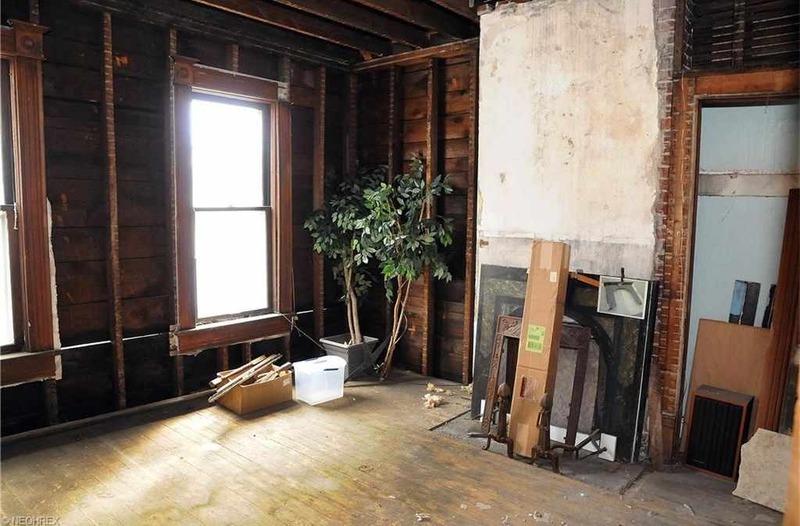 Many of the windows are new replacements but salvage versions probably wouldn’t be too difficult to find. 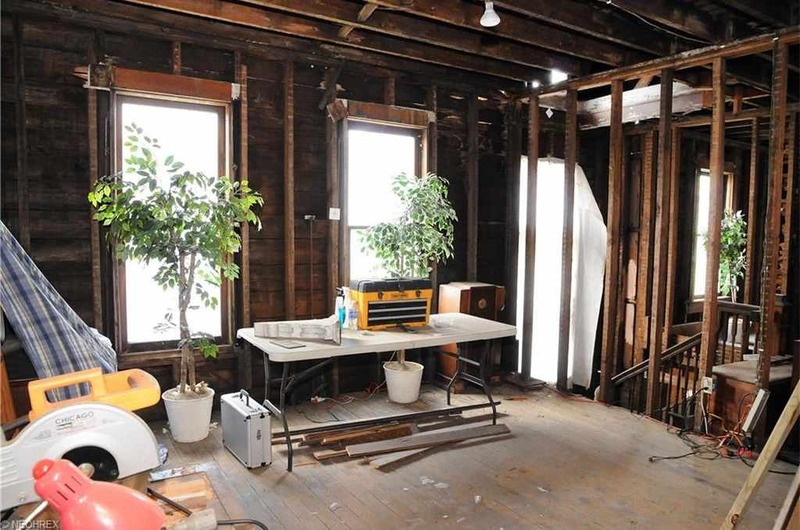 Ohio has been going on a demolition rampage for several years now so salvage resources are plentiful. 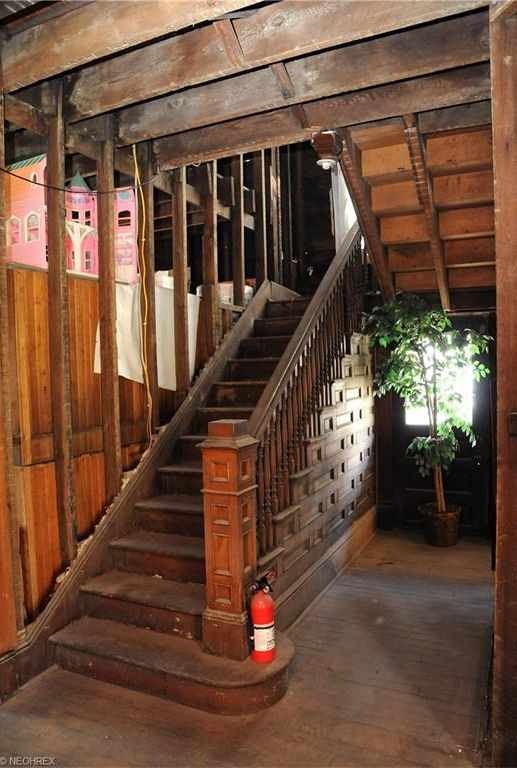 In summary, I now see possibilities for this house where I didn’t before. 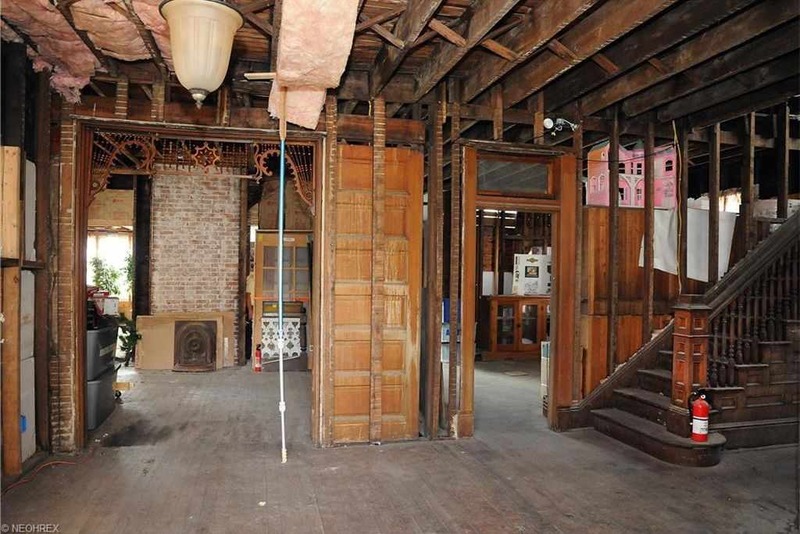 In the right hands, this one could be a Victorian gem again. I like the “onion” dome and different roof lines. Looking at wall studs is a little unsettling but it does give you the best opportunity for electrical and such. The yard and fence are beautiful, just needs some flowers and bushes appropriate to it’s building time period. How many rooms and bathrooms are in this house ? Of course this comment is well after the house was posted and sold, but I’m still going through older posts since I discovered this site. 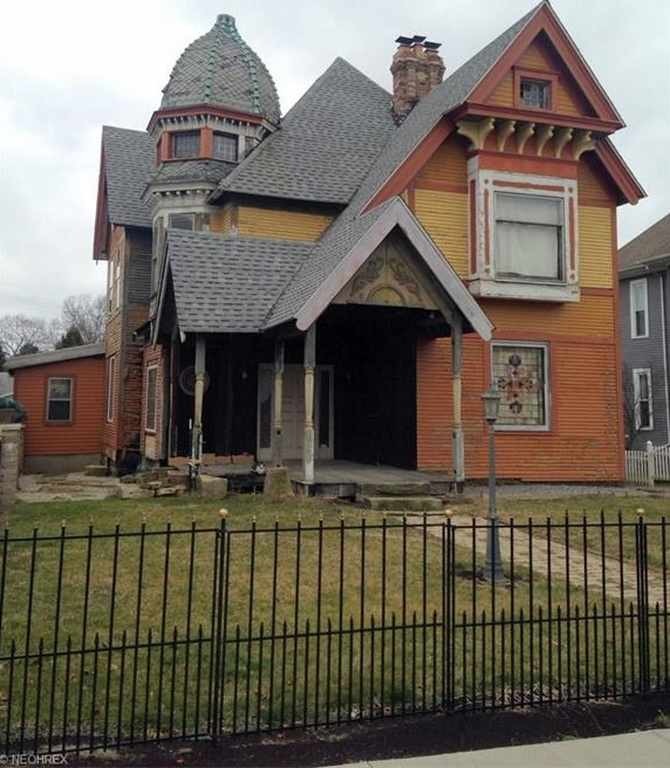 I wanted to add a little info about Cambridge because there are a lot of really affordable, lovely older homes and more might show up on this site. I live in WV and work in Eastern/Central OH and northern WV. I sell to independent retail businesses and I can get a decent gauge of the town’s overall economic state by how many of such shops there are, how much they order versus previous years, how vacant the downtown buildings are (or not so vacant), etc. I’m in Cambridge a lot and it has an overall thriving downtown area. Few vacancies, lots of various shops that for the most part are doing well. There is a decent sized hospital there, there are three airports within 1-2 hours drive (Pittsburgh, Canton/Akron, Columbus). I’ve considered looking at homes in this area, but I’ve hesitated because I want to stay close to my elderly father. One could live here and work in Zanesville, Canton/Akron, Marietta, Parkersburg, Wheeling…there are options. It has a strong tourist trade, and every year the big even is the Dickens Christmas theme. My one caveat is that there is a significant amount of crime due mainly to drug issues, at least more than you’d normally expect for a town of that size. But if any of you search older homes in Cambridge you’ll find some steals. And if you visit the town you may very well like it as I do. 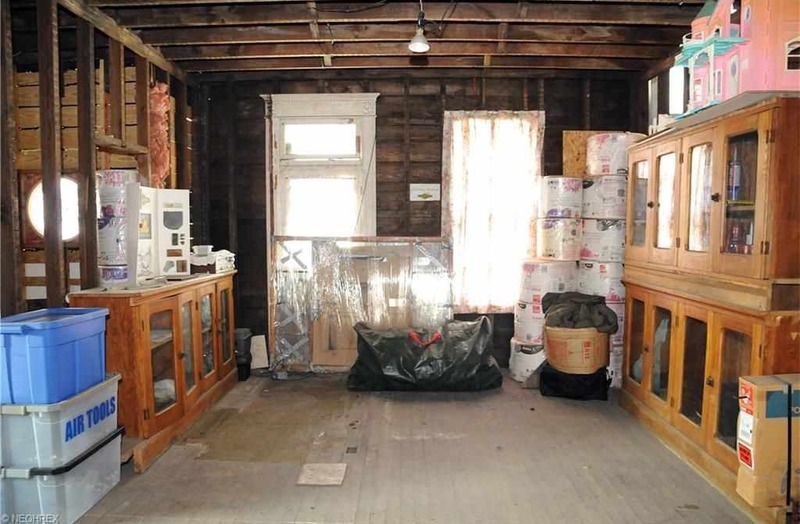 We, as preservationists and preservation enthusiasts, must do a better job informing the old-house-buying public that gutting old homes to install insulation and new systems frequently results in unnecessary costs. There are less destructive means to accomplish the same improvements. Equally important, many types of wall insulation either do not pay for themselves, or worse fail completely or actually do damage. As an example: the ‘Emily Dickinson’ house was insulated by Amhurst College. An architectural conservationist told me no one was able to talk the College’s facility management director out of completing the project. 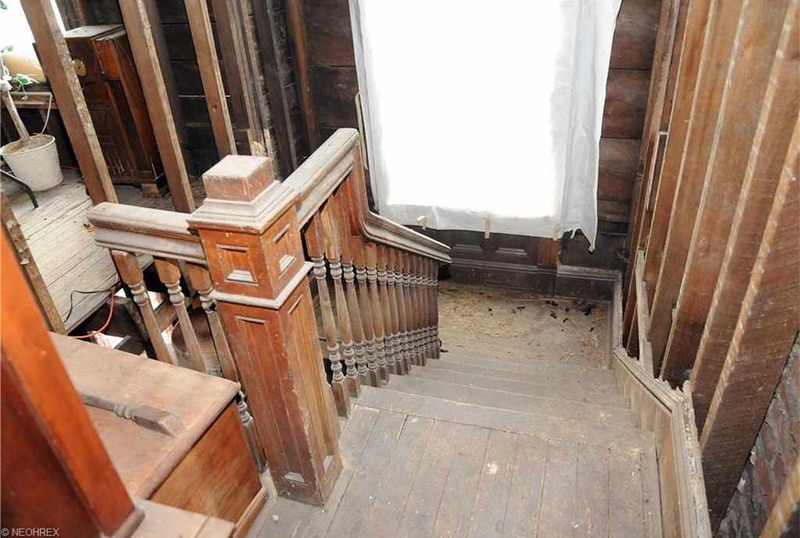 The result trapped moisture within the walls, where it collected as condensation, causing serious rot damage to the sill plates of the frame portion of the house. 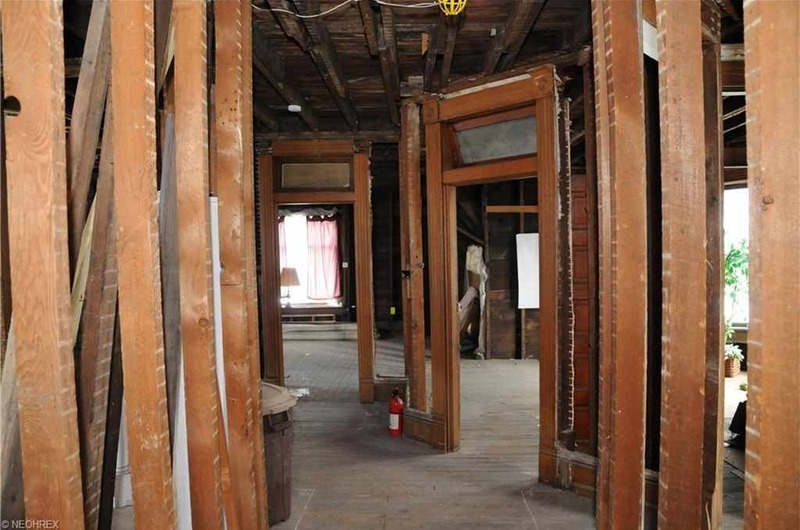 Using thermal imaging, the University of Vermont’s preservation program documented the complete failure of both blown and foam insulation to adequately fill the wall cavities due to blocking and old random framing. There were large voids. 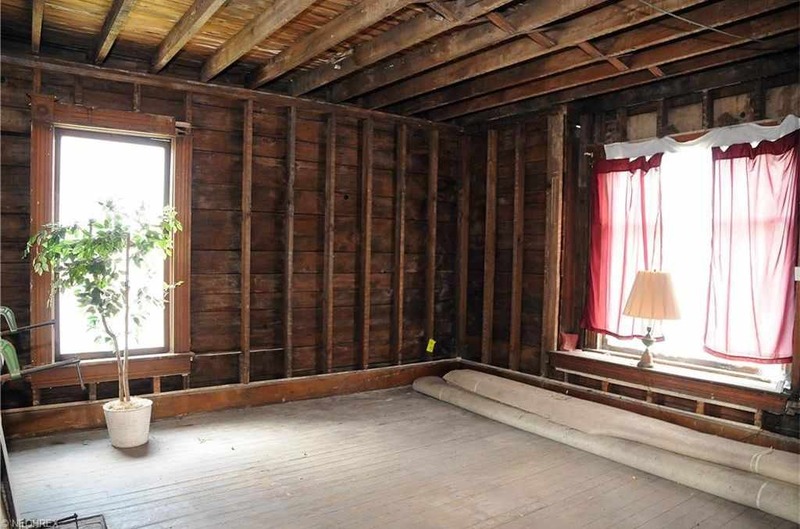 In addition, at that time many years ago, they determined that frequently wall insulation did not pay for itself. Someone should repeat the study to see if that has changed. 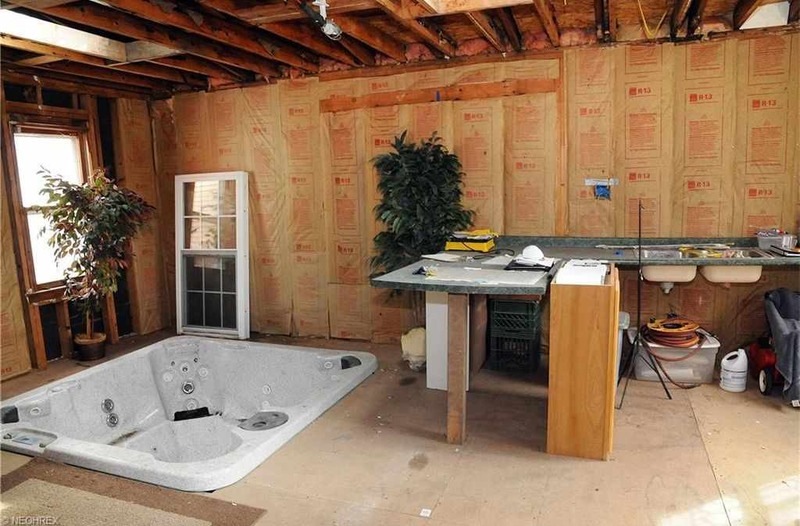 Finally, and perhaps I am misreading the photographs, what is the hot tub doing in the kitchen? Was a wall removed to create that space? 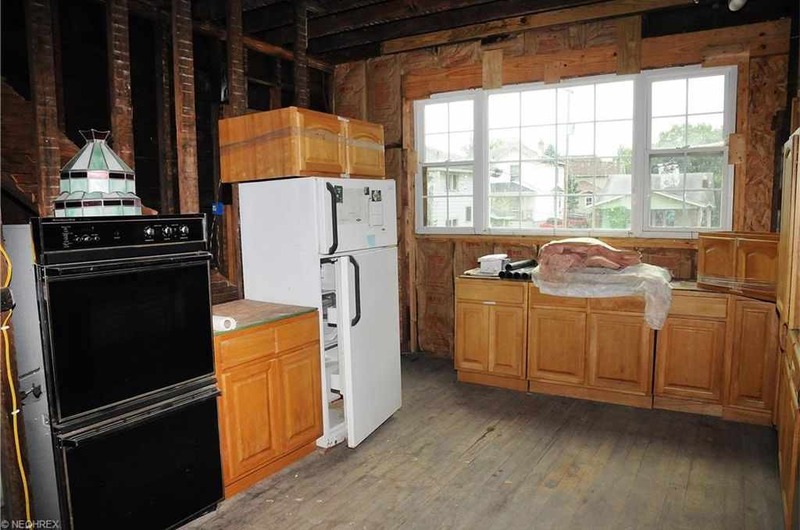 No, it’s a different room not the kitchen.